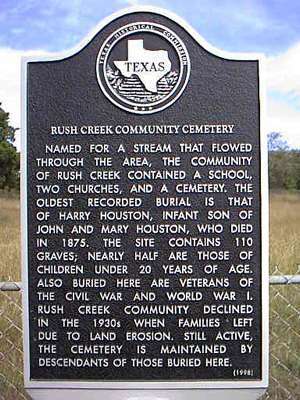 "Named for a stream that flowed through the area, the community of Rush Creek contained a school, two churches and a cemetery. The oldest recorded burial is that of Harry Houston, infant son of John and Mary Houston, who died in 1875. The site contains 110 graves; nearly half are those of children under 20 years of age. Also buried here are veterans of the Civil War and WWI. Rush Creek declined in the 1930s when families left due to land erosion. 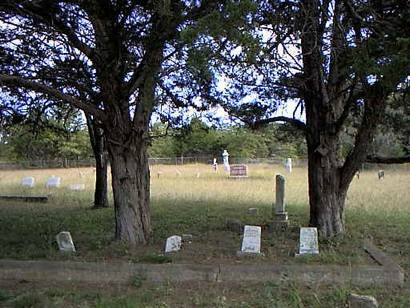 Still active, the cemetery is maintained by descentants of those buried here." We have sincerely been enjoying the information about the Ghost towns in and around the DFW area. We will have to share some of our findings about some of the visits we have had.